After defeating then-No. 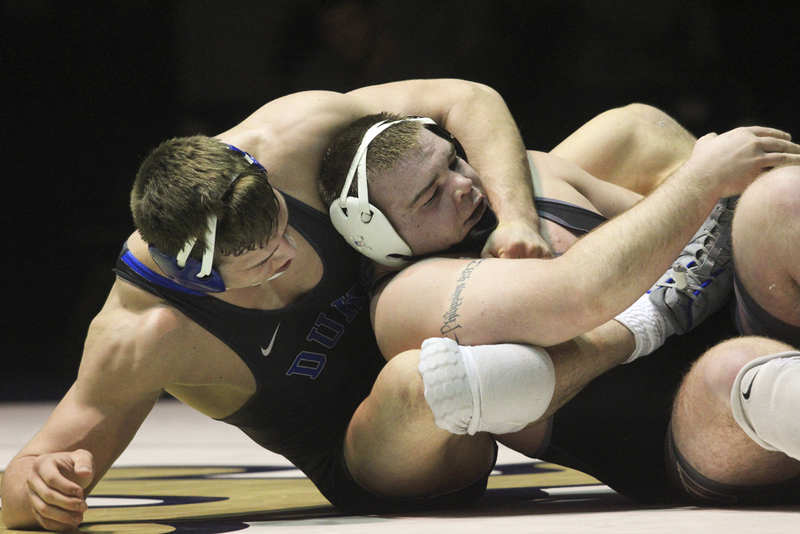 3 ranked Duke wrestler Jacob Kasper, the ACC awarded Pitt’s Ryan Solomon Wrestler of the Week Tuesday afternoon. Solomon, ranked 15th in the country in the 285-pound weight class, also received the Wrestler of the Week award earlier this year on Nov. 16 after a win over No. 13 Edinboro wrestler Billy Miller. The only other teammate to get the nod from the conference this year is No. 8 junior Dom Forys, who has won it twice based on his wins over Iowa State’s Earl Hall Jr. on Feb. 10 and Lehigh’s Scott Parker on Nov. 20. For the first two minutes of this weekend’s bout, Kasper and Solomon circled each other without scoring. Sensing an opening, Solomon took down Kasper with a minute left in the first period to score the first points of the match and gain a 2-0 lead over Kasper. Before the period ended, Kasper escaped to get on the board but when the siren sounded, Solomon took a 2-1 lead into the second. Solomon began the period from the top position, but 35 seconds after the resumption of play, Kasper escaped again to get back in neutral. After about a minute and a half of stalemate in neutral, the wrestlers took a 2-2 match into the third period. This time, Solomon started in the bottom position, but he promptly scored a reversal on Kasper to score two points. Shortly thereafter, Kasper got off the mat and onto his feet, scoring a point on the escape and making the score 4-3. Solomon almost lost his grip on the bout with 30 seconds left when Kasper appeared to take the Pitt wrestler down to take a late lead. Fortunately for Solomon, the referee ruled the wrestlers out of bounds and the two athletes returned to the center of the mat with no points awarded. Kasper didn’t get another chance and Solomon squeaked by with an upset victory. Co-head coach Matt Kocher believes that tonight’s result is proof of Solomon’s high ceiling this postseason. Solomon, while proud of the win, was quick to point out he couldn’t rest on his laurels, and his focus had already turned to the ACC and NCAA tournaments. Solomon and the Panthers will compete at ACC Championships in the Reynolds Coliseum on Saturday, March 4, in Raleigh, North Carolina.